J. R. Roberts’ classic Adult Western characters returns to print in THE GUNSMITH #413: DEMON’S CURSE from Pro Se Productions. Bad men of all types have come after Clint Adams. But can even The Gunsmith stare down a devil in a showdown? Adams rides into a New Mexico town that is in the grip of insanity. Townspeople turned murderers, men killing family and friends without rhyme or reason. Though The Gunsmith is skeptical, many believe that the town is cursed by a demon from Hell. It isn’t until Adams sees the savage violence for himself that he decides, man or demon, something must be done. From the heights of madness to the depths of the Earth itself, The Gunsmith means to end whatever curse holds the town…or die trying! 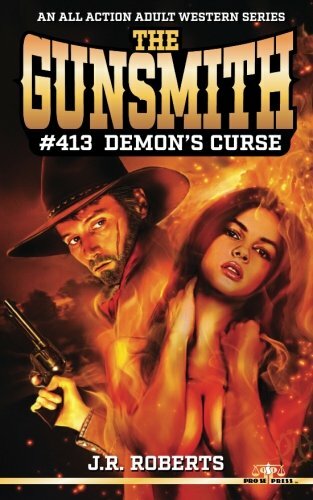 THE GUNSMITH #413: DEMON’S CURSE by J. R. Roberts. From Pro Se Productions! Featuring cover and logo design by Jeffrey Hayes and print formatting and cover design by Percival Constantine, THE GUNSMITH #413:DEMON’S CURSE is available now at Amazon at https://www.amazon.com/Gunsmith-413-Demons-Curse-J-Roberts/dp/1548168238/ref=sr_1_fkmr0_1?ie=UTF8&qid=1498838227&sr=8-1-fkmr0&keywords=gunsmith+413+printand Pro Se’s own store at www.prose-press.com for 8.99.